I am working on a New Year's Eve party for one of my favorite clients. I had the privilege of planning a sweet sixteen party for her this summer, so I am super excited to be planning another fun gathering. I don't want to tell you to much and spoil the surprise, but I thought I might give you a little peak of what we are doing in case you were looking for something to add a little fun to your New Year's Eve House Party!! I thought it would be fun to have a fire pit going in the driveway for all the guests to enjoy. 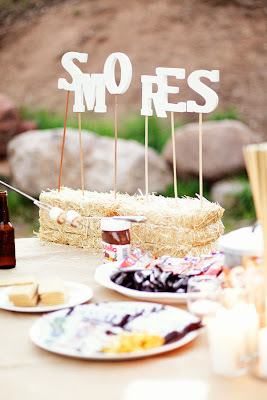 Picture hay bails around a fire, throw blankets and what else but a S'MORES station. There is nothing better than a graham cracker with chocolate and marshmallow!